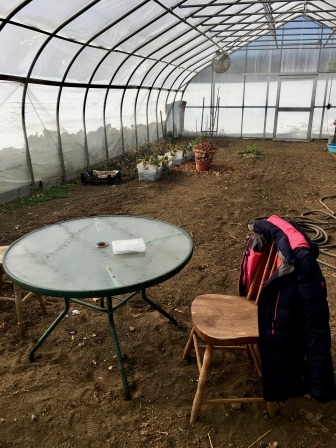 The month of May means many things in the Farm’s calendar – seedlings start to leave the greenhouse for the fields, after-school education programs return, and the farm stand moves from once-a-week eggs-only towards a full week with veggies, eggs, and delicious snacks. 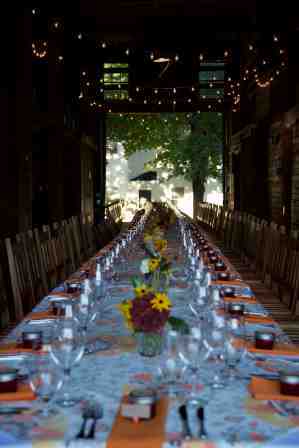 For the Farm event team, it means something even more: parties return to the 1827 Barn! Regular visitors to the farm know that we do many public events throughout the warmer months: Family Farm Nights in June & July are our most popular event but we also do Spring Fling in May (this weekend! 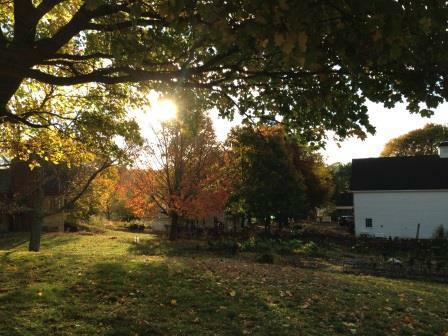 ), Summer Solstice and Fall Equinox parties, Farm-to-table Suppers in the late summer, and our annual Harvest Dinner in September. The most attentive visitors know that we also host private events, everything from children’s birthdays to graduations to family milestones to weddings. 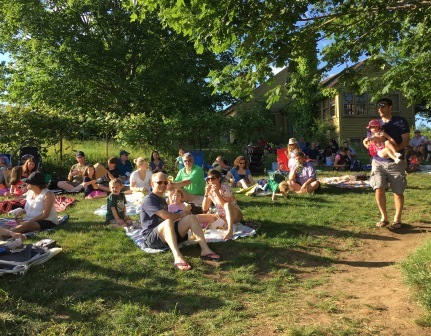 People who come to the farm to celebrate the important moments in their lives aren’t just looking for a place to have a party – they are connecting themselves and their guests with history and nature in a way rarely seen in event spaces. It’s why so many people come back to our events year after year. And why more than one party guest has become a volunteer in our fields. 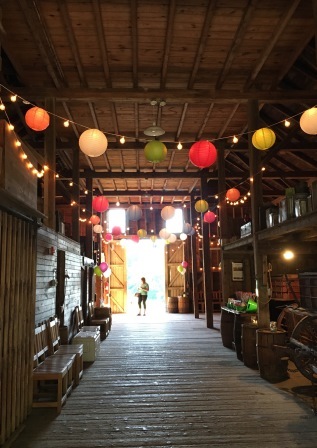 Our event team definitely has the most unusual job description at Wright-Locke Farm: they must love helping organize beautiful events, but they also enjoy working outside in all weather, moving heavy wooden barn chairs, climbing ladders, having dirty hands, and chasing runaway paper lanterns (and the occasional lost sheep). These night-time farmers of Wright-Locke Farm are some of the best problem solvers I know – they can hang anything from the Norway maple on the hill used as our wedding ceremony site. Need to hang a poster in the barn without using any nails? But of course! Sudden hailstorm changing your outside summer fete to a cozy fall barn party? Not a problem! Here’s looking forward to a season full of starry nights, happy families, vibrant music, and delicious food! 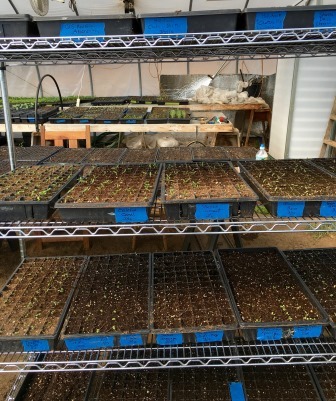 As a nor’easter bears down on our small greenhouse, it is hard to imagine that these dozens of trays of inch-high flowers will soon fill those snow-covered fields outside. But this is how flower season at Wright-Locke Farm starts. In February the first seeds of eucalyptus, straw flowers, delphinium, celosia and others are carefully started in our tiny incubator, nurtured through dozens of labor-intensive ‘bottom-watering’ cycles so that light-sensitive seeds are not disturbed, graduated to our gently-heated greenhouse, and then finally transferred outside for a week of hardening off before being planted into solid earth starting in May. Meanwhile in the fields outside, these late spring snows truly are a “poor man’s fertilizer” as my grandparents farming in Vermont were fond of saying. Only recently did I learn that not only does snow serve as a source of water and insulation, but it also captures nitrogen when snowflakes crystallize in the atmosphere, and brings this important nutrient back down into the soil. Exploring this passion for growing flowers is made so much easier today than farming was for them, in no small part due to the ability to investigate information like nitrogen-capturing snowflakes online. My grandparents would have been astounded at how much you can learn about farming with the click of a button! Fortunately for all of us, I have real-people resources in addition to the internet. 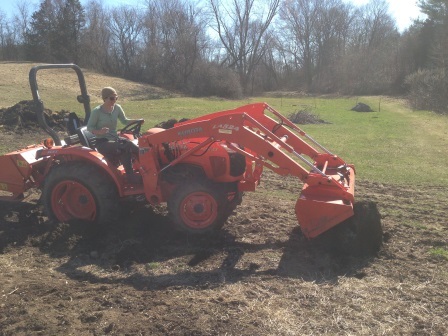 Adrienne Altstatt, our Farm Manager gave us “A Glimpse of the Life of a Farmer” in her terrific blog last month. Though I’ve been gardening for decades, last year was my first season growing flowers at Wright-Locke Farm, and Adrienne’s matter-of-fact “It’ll all be fine” was a welcome response to my frequent “oops”! Flowers have their own rhythm and are more fragile than many veggies, but they are subject to fewer pests – and like veggies, growing flowers also takes faith and a great deal of patience. 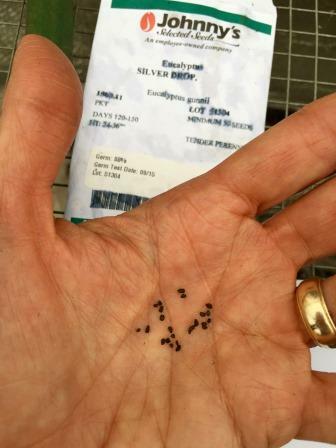 Planting thousands of near-microscopic dark colored seeds into black potting soil requires focus, deep breathing and frequently, tweezers. It never fails to amaze me that these teeny packets of DNA and requisite foodstuffs respond to our gentle nurturing, some air, some water and a little organic fertilizer, and transform themselves into colorful plants as tall as ten feet within a few months. Gosh this is hard work! 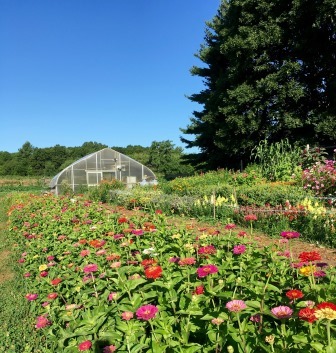 It is a challenge bringing an interesting selection of fresh flowers to market each week, and requires successional plantings of many of our dozens of flower species. Trying to keep a changing array of colors, textures and blossom sizes that work well together in bouquets, all blooming throughout each week of the season, requires pouring over multiple spreadsheets during the winter months. Strategizing how to rotate beds so that recurring pests like cut worms and powdery mildew are minimized leaves me cross-eyed. As does clustering species with similar netting needs, maximizing sun placement within our small field and creating shade and moisture microenvironments that hopefully provide ideal conditions for each species. 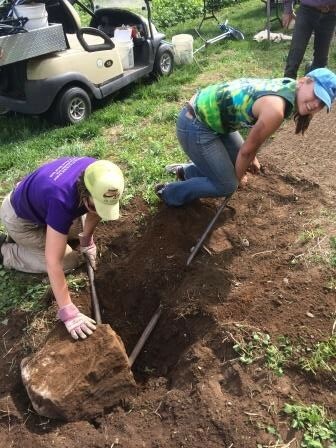 Balancing these factors with the field life of each species, vase life, irrigation options, harvesting time, and cost often leaves me feeling like a pretzel! Fortunately I don’t do all of this alone. 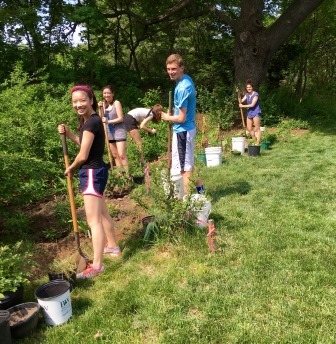 In addition to our Farm Manager, the flower operations are blessed with an amazing team of volunteers. Last year dozens of volunteers, from pre-teens to folks with decades of life experience, showed up to seed, weed, water, plant, harvest and generally help out in myriad ways. The Farm is especially lucky to have a loyal team of highly talented floral designers who help us bring those beautiful flowers directly from our fields to vases for you. Why do local flowers matter? I never envisioned myself following in my grandparents’ footsteps, but I am so grateful for this amazing journey and opportunity to bring beauty to our community. Stop by and visit our ever-changing beautiful flower fields throughout the season! As the first employee of the Wright-Locke Farm Conservancy, I came to the farm in April of 2011 thinking I would be here for just a year. But now, six years later and about to start my seventh growing season, one might say I’ve settled in. 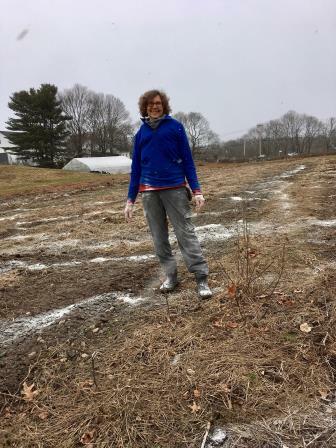 I grew up in Minnesota and, before Wright-Locke, I managed a farm in Maryland for six years, so acclimatizing to the culture of New England and becoming familiar with the local farm community has taken some time. Nonetheless, it has slowly grown on me. 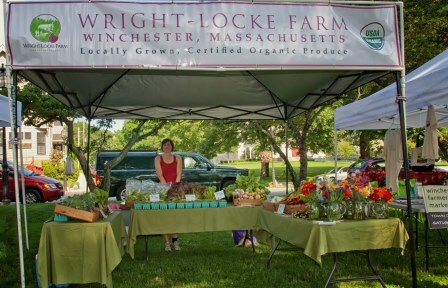 Here’s a little insight as to what it’s like being the farmer at Wright-Locke Farm. My work begins in March when I start seeding in the greenhouse, hiring staff and organizing our sales outlets (CSA and farmers markets). March is when I spend the most time at my desk. After that, I’m rarely here and my desk is more a repository for my papers and the occasional perch for the farm cat. As the weather changes and becomes more inviting to young plants, my crew and I begin the long process of transplanting and seeding the fields. We also prep our barn work space for efficiency and ease during the season and set the animals (goats, sheep and chickens) up in their warm season quarters. Especially in the early part of the season, farming is often a “watch-the-weather” game and patience is one of the most important virtues for a farmer to have. The end of May is when the season truly kicks into high gear for us. 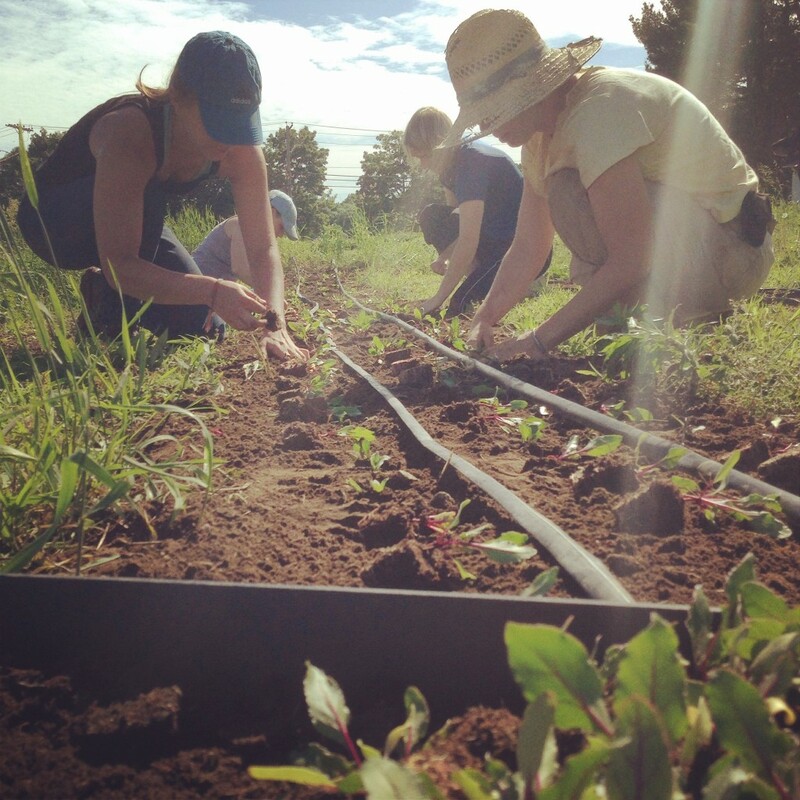 On top of planting seeds and transplants, we begin harvesting three days a week for our markets and CSA and, now that the weeds have started to grow like…well…weeds, we also have to add weeding to our ever-growing “To-Do” list. With so much needing to get done, balancing the daily demands of the farm is key and knowing when to let something go from your list sometimes takes courage. For the next five months (June—October), our days are fairly similar in terms of tasks, but as most farmers will tell you, there is always a monkey wrench in there. Tractors break, droughts or deluges happen, someone accidentally weeds the wrong plants out, animals or insects decimate a crop, someone finds a bug in their salad, four-foot-tall weeds take over, you twist your ankle playing soccer, etcetera, etcetera, etcetera. 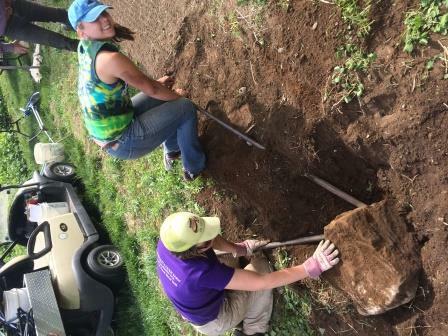 Farming is a test of flexibility and adaptability, and sometimes that can be trying. However, in the quiet evening hours when I have the farm to myself and the dog and I are wandering the fields, I can’t help but delight in the beauty and magnitude of this small farm. All of that peak-season “go-go-go” can be exhausting, but sooner than you can say zucchini with an Italian accent, the season is wrapping up. However, just because the temperature drops and we stop harvesting veggies doesn’t mean the season is over—it is time to plan for next year. A great deal of a farm’s success comes from the pre-planning for the following year—cleaning, tallying, mapping, organizing—all so that you’re ready to hit the ground running when the next season starts. It can take years to understand trends and realize that nobody wants to buy your okra in New England (at least not enough people to make it worthwhile), or that your soil grows potatoes poorly, or that people are over kale. So, it’s important to take that accumulated knowledge and apply it to your plan for next season; because you can always make it better next season. But most excitingly, when seed catalogs come out in December, it’s time to dream again! The take away? Farming is about patience, balance, letting go, a little bit of planning, and a lot of faith. I would say that farming is inherently about faith: faith that if you put a seed in the ground, it will grow; faith that people will buy your product; faith that the weather will be favorable; faith that you can continue to do this work and it will be appreciated and successful. Much like life one might say. Be well and happy growing!